SAVE 25% on your midweek overnight stay! Save 25% off your next Hotel Stay! Protect your small business while also connecting yourself at all times. 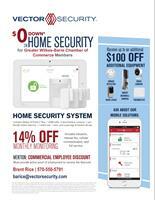 All Greater Wilkes-Barre Chamber of Commerce members are eligible to received a Free Basic System with a 14% Discount on the Monthy payments and $100 off additional equipment outside of the Basic Package, such as Cameras, Smart Door Locks, or Smart Thermostats. GWB Chamber Members are eligible to receive a Free Basic System w/ discounted Monthly rate. We will work with you to customize a program and increase your bottom line so you can spend more time growing your business. Our experts will get to know your company and it's employees before structuring anything. All we do is save you money!